New kid (bird?) on the block, the Emu electric bike. 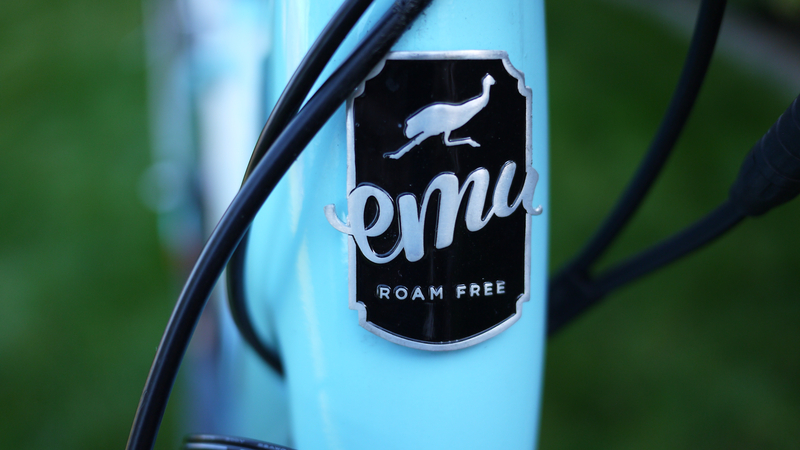 Delbanco Meyer & Co Ltd are behind the new Emu brand. Established in 1936, the company is more famous for being the world’s largest bristle merchant but in more recent decades the firm has moved into textiles, property development and now the Emu electric bike! The bike is based on an existing design from Protanium, a multi-national Dutch company that used the design under the name Diavelo which some of you may remember! It won a Eurobike award back in 2011 as well as other awards from Taipei Cycle and IF. 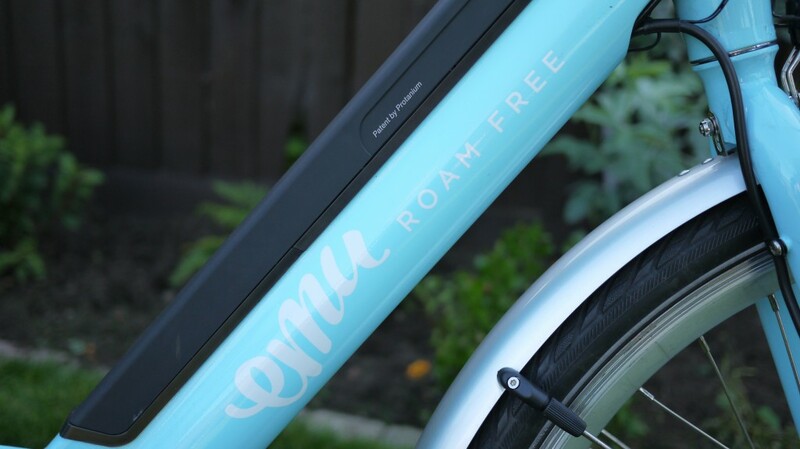 With the styling and ‘Roam Free’ moniker, the Emu seems to be pitched particularly to appeal to the younger, trendy end of the commuter market. I first set eyes on the Emu when visiting the Norfolk Cycle Show back in June. While only having time for a quick ride of both models around Norwich town centre, their striking colours made heads turn on the bikes’ first public showing. Andreas from Emu was kind enough to send us the step-thru model which we’ve now spent a couple of weeks with, testing it for range, hill-climbing and commuting abilities. Weight: Battery 2.4Kg, Bike 20.6kg. Total 23Kg. The Emu is priced at £999 for either the crossbar (classified as Men’s) or step-thru (Women’s) versions. It is available direct from Emu’s website, or through their demonstrator network. Those not near a demonstrator can request a 3-day trial. There is a 2 year warranty (excluding normal wear and tear). You’ll need to get the bike serviced at its first anniversary to keep the warranty valid and this will need to be at an EMU-approved retailer. The Emu arrives in an impressively huge, brown box, thankfully ready assembled. No need to attach the front wheel, it’s already attached. Just straighten and tighten the handlebars, affix the pedals and you’re good to go. As ever with unboxing new bikes, I’m always tempted to jump on and ride away, but it’s always a good idea to give the battery a charge. The word to describe the bike when you first set eyes on it is: Bright! The frame has been painted in a eye-pleasing – and fairly vibrant – pastel blue. The frame colour contrasts nicely with the black battery, integrated in the down tube. That contrast visually alludes to a thinner and more streamlined appearance. In fact – and unusually for me – I actually prefer the step-thru version to the crossbar one. The crossbar’s appearance is one of relative chunkiness, especially in black. This model is advertised on the Emu website for women, but I think they’re underestimating its appeal as a unisex bike. The brushless 250W front hub motor is powered by a 36V lithium battery. Inside you’ll find Samsung cells and a 10.4Ah capacity giving 374Wh at your disposal. 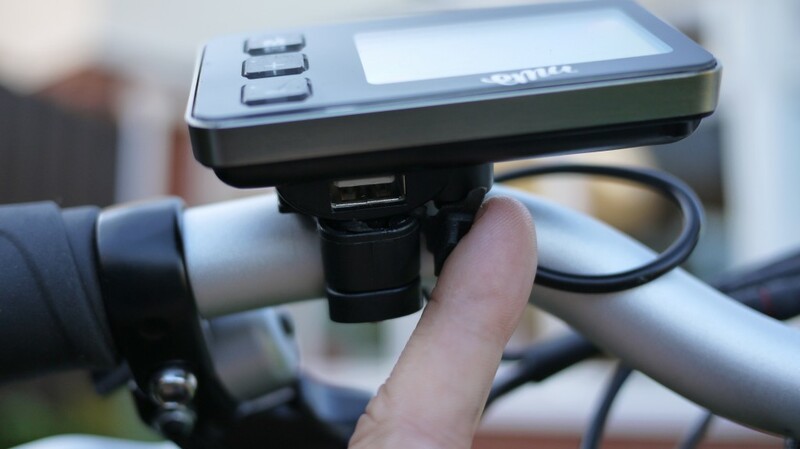 The battery can be locked in the frame, making it more difficult for a casual thief to take it from the bike should you need to leave your bike unattended and it snaps in and out easily using one of the supplied keys. The battery does come with its own ‘power remaining’ display, through the use of four LEDs showing the capacity remaining from empty (E) to full (F). The lock is just above the top of the battery nearest the stem and the battery itself has a nice rubberised coating, making it easy to grip when removing/reattaching to the bike. It’s also quite slim too. You can charge the battery either on or off the bike using the supplied mains charger. The charger itself is very compact, looking more like a laptop charger than the normal ‘brick’ you get with many e-bikes. This could be useful if you need to carry the charger with you (to recharge the battery at work for example). 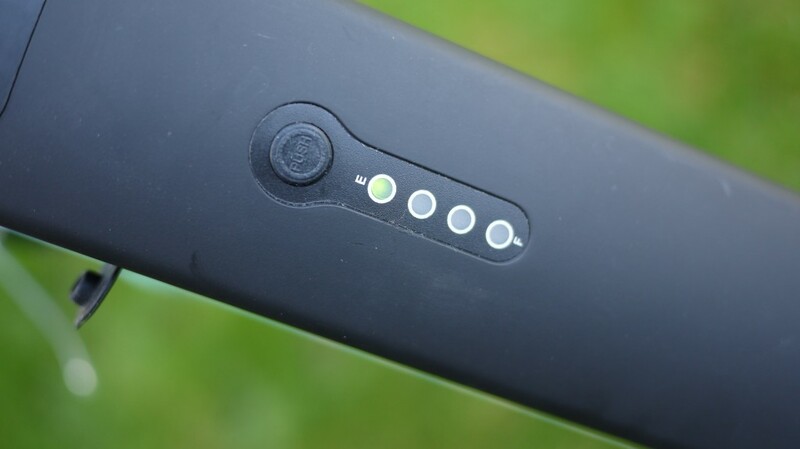 A rubber flap on the side of the battery reveals the charging point. It took about 7 hours to recharge it from flat. 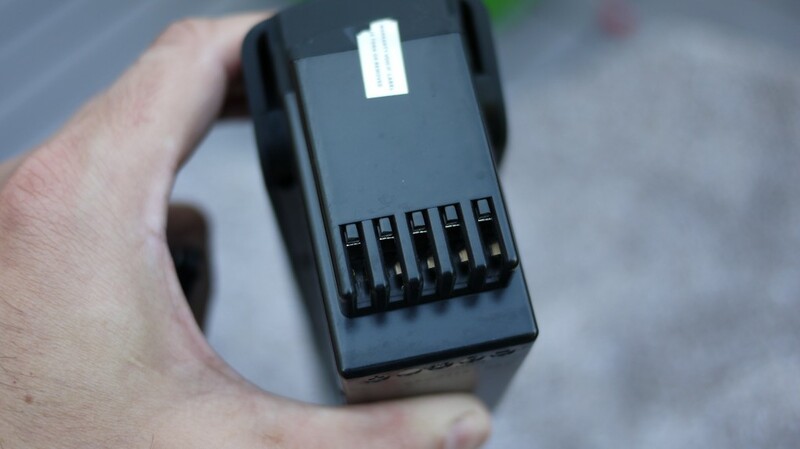 While charging, a small light indicates charging progress at the top of the charger unit, initially showing amber until going green when fully charged. EMU state that they “recommend an overnight charge and a fast charger is available if preferred”. One thing I noticed was that it was possible to leave the battery ‘on’ while charging, so make sure you press the small power button above the row of LEDs to turn it off. This is important during the winter months if you decide to store the bike and battery for long periods. The battery is rated for 800 full charge cycles and up to 4000 half-charge cycles if used regularly. Stepping onto the bike, the LCD display is seated next to the left hand grip. 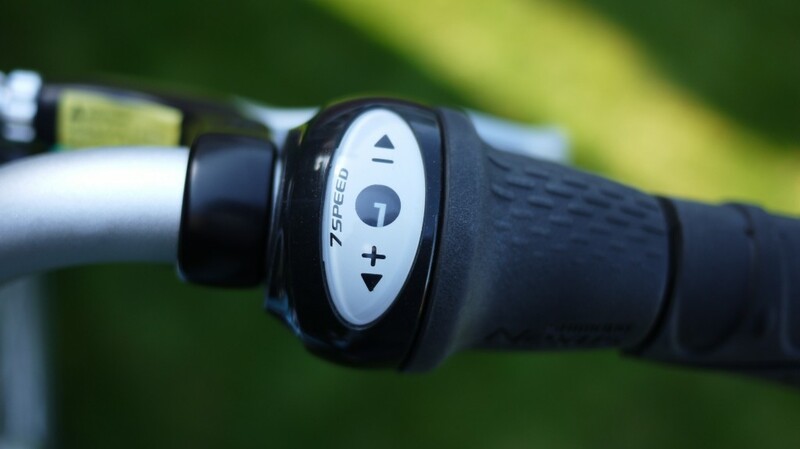 To turn the bike on, just hold down the ‘M’ button for a couple of seconds and it springs into life. The display is a decent size and easy to read, giving you all the important information you need while out and about. It’s not removable though. The top-half of the display shows you things like the current speed, maximum speed etc. as well as the current ‘mode’ or assist level. There are 6 levels of assist on the Emu. The + and – buttons allow you to select the assist level either when stationery or while moving. On the display, you’ll see the assist level on the bottom portion of the screen (PAS 1 to 6). PAS 0 is off, 1 and 2 (Eco), 3 (City), 4 (Tour), 5 (Power) and 6 (Boost). By default, the assist level when you first switch on the bike is level 1. Next to the assist level is the current ‘battery remaining’ indicator, broken up into 5 bars (100%,80%, 60%, 40% and 20%). To the right of that, is the current consumption in Watts which is quite useful in gauging how much assistance the bike is giving you at any moment in time. Pressing the ‘M’ button will also cycle through the other information such as max speed, trip and time etc.. The Emu joins the recent trend to include USB connectors on the battery/display to charge your mobile phone, for example if you’re commuting in a busy city and want to use your smartphone’s navigation function. 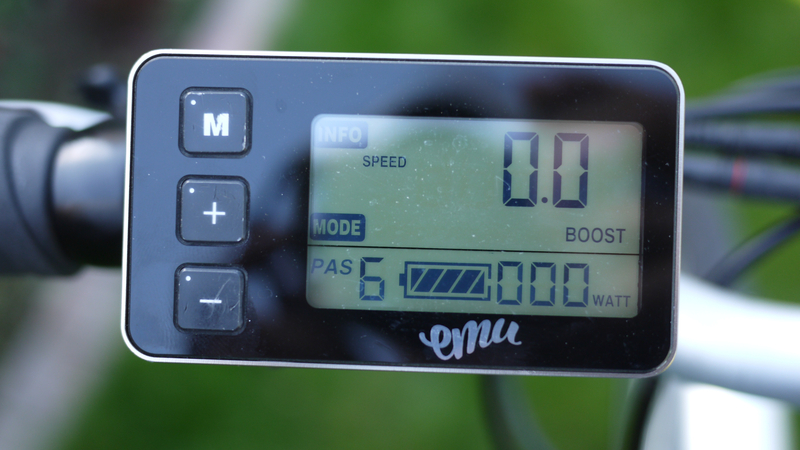 In the Emu’s case, the USB port is behind a flap on the rear of the LCD display. For those of you who want a walk-along mode, pressing the – button on the display triggers it, providing assistance up to max of 4mph. Heading out into my local village for the first ride, the bike pulls away cleanly. It doesn’t have a torque sensor, instead having a cadence sensor. So, after a pedal revolution or so, you feel the motor kick in. Setting the assist level to max, the bike quickly reached the maximum assisted speed before the motor cut out. I use my own Garmin Edge GPS to keep track of ride data and it was informing me that the top speed was 17mph, so it is just within a hare’s whisker of the 10% tolerance to keep it legal. One thing I noticed when accelerating was that the motor is fairly noisy and whiny as it builds up speed and torque. It’s not a bike you’ll sneak up to other people on, you can hear it. On the gearing side of things, it’s good to see that the Emu has adopted the Shimano Nexus 7 hub in the rear wheel with a twist shifter on the right grip. 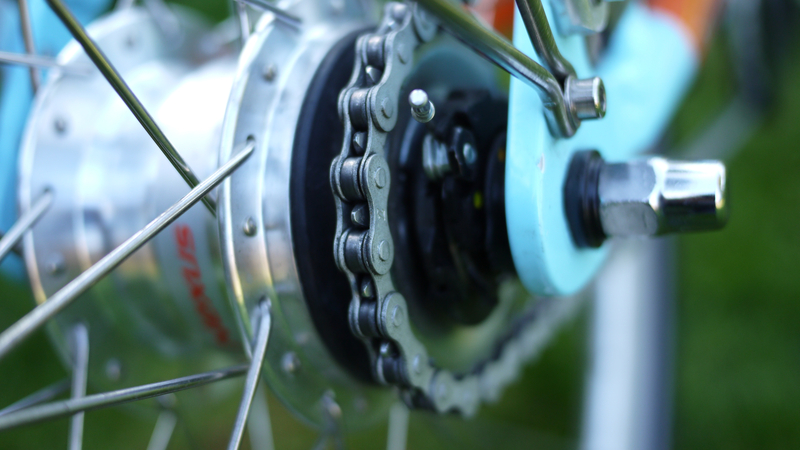 The shifter does have a small indicator to show you what gear you’re in, but you’ll find with hub gearing, knowing which gear doesn’t really matter. If you have to stop suddenly for example you’ve been caught by a red light, you can quickly twist back a few gears. The Nexus 7 trades range (244%) for simplicity and ease of use and although in theory, a little bit of power is lost internally compared to a higher-end derailleur setup, in practice you’re unlikely to notice. To bring you to a stop, the Emu is fitted with rim brakes. I found the brakes adequate during my testing. They were quite noisy, but they are simple to adjust and maintain. They do have cut-outs though which will cut power to motor when depressed. The stem height and angle are adjustable and the bike comes with a traditional bell, no sign of an electronic bell – yet! 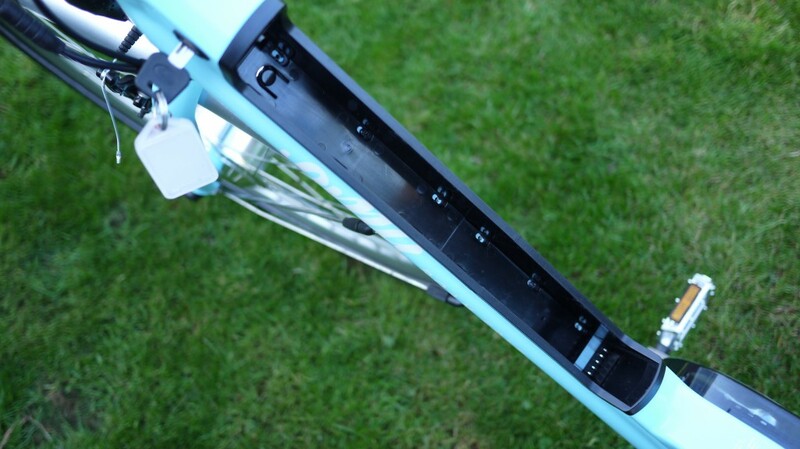 While saddle height is adjustable, this can only be done using an Allen key. 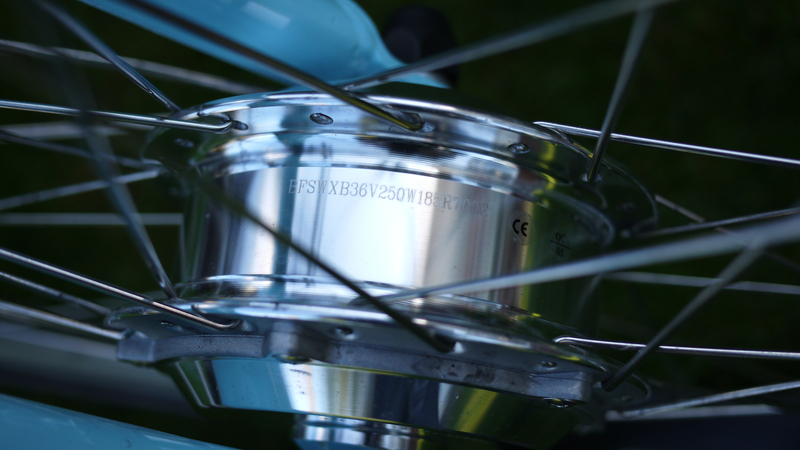 Also there’s no quick release on the wheels because of the hub gearing. Heading out around the Lakenheath and Mildenhall air bases in Suffolk, the test route is mainly flat and open. Thankfully the sun was shining but, as usual, there was quite a strong wind to contend with, which is this area’s best shot at simulating demanding terrain with hills lacking in this area. Starting out with a freshly charged battery, 5 full bars show on the display. The first bar on the battery meter went out at just over 4 miles into the journey. The second at 10 miles, 3rd at 15 miles and the fourth at 20 miles. Feeling some disappointment with the battery meter flashing at 25 miles I was expecting a long, unassisted ride home. With an even stronger headwind facing home, I was expecting the battery to give up at any moment, but it actually carried on providing assistance once I reached my home village. With that achieved, I wanted to carry on until it gave up completely; finally at 38 miles – another 13 miles after the range meter started flashing – it did. My average speed for the route was a very respectable 13.2 mph, which was based on my trying to maintain the bike’s speed at, or around, the 15.5mph limit. Hill testing sees a return to the Suffolk village of Hartest again, which has one of only a few steepish hills in East Anglia, with a 17% gradient at its peak. For the first test, I wanted to climb the hill as fast as possible using the maximum assist level, which is 6 on the Emu. At just over 1/4 mile in length, I managed to complete the climb with an average speed of 9.4mph. On the second test, I pedalled gently and slowly to trigger the cadence sensor but not enough to be putting in any real effort of my own, trying to simulate a throttle powered bike. It managed to climb the first 1/3rd of the hill which is around 10% on power alone before losing speed and coming to a halt. It wasn’t possible to get up the rest of hill without considerable effort on my part. According to the display, the bike’s assistance maxed out at around 410W. My view therefore, is that this a bike best suited to less undulating terrain, unless your own leg power copes well with steeper gradients, which would suggest the Emu is more at home in an urban and city setting. 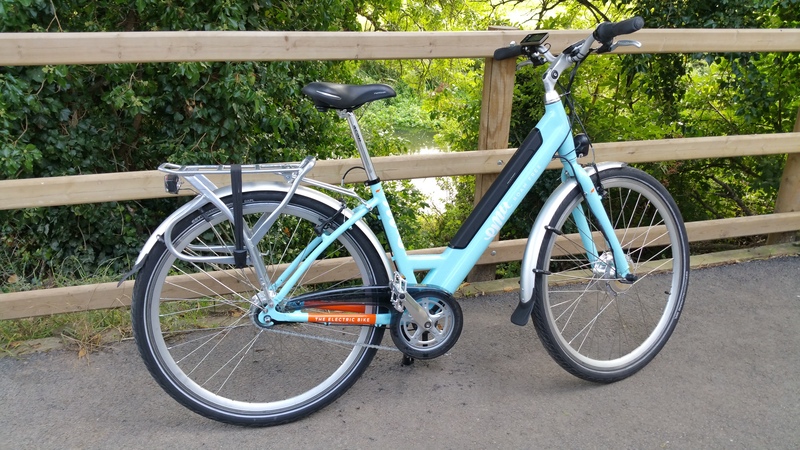 For those interested in purchasing an electric bike for commuting, the Emu comes fitted with a rear rack onto which you can fit a couple of panniers and there are also elasticated straps to hold down items on top. 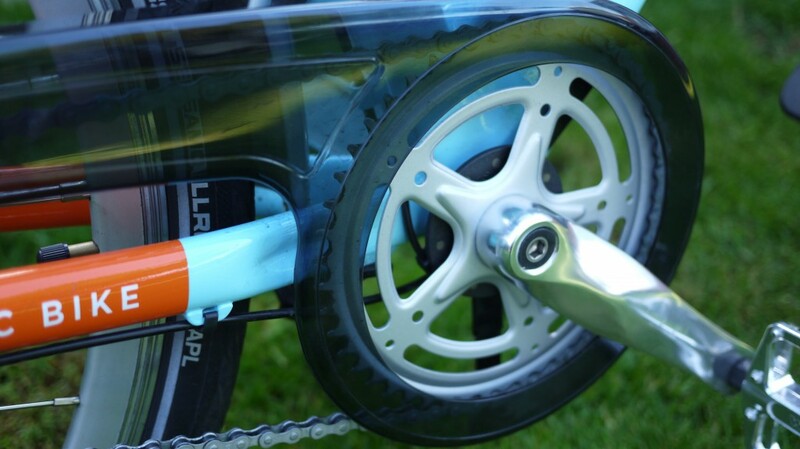 To keep your skirt/trousers free of dirt and oil, there is a chain guard fitted as well as full-sized mudguards front and rear. 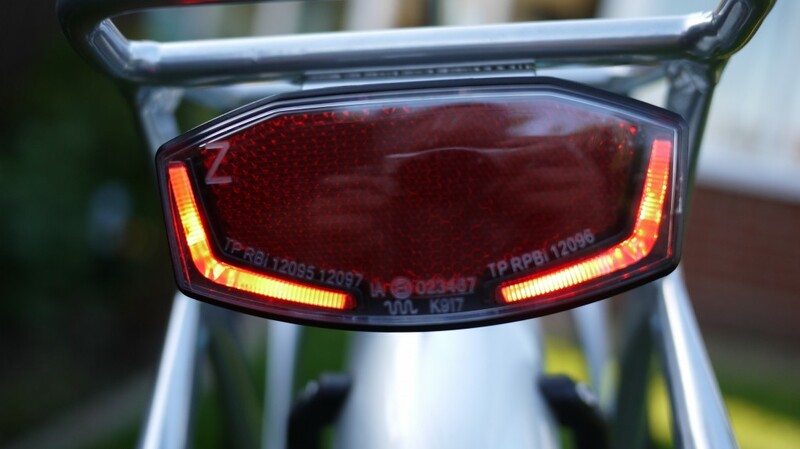 To help light your way on the dark winter evenings, front and rear LED lights are powered by the main battery; holding down the + button on the display activates these. Whilst not ‘super’ bright, they’re good enough for urban environments rather than unlit country roads. There are no modes, they’re a straight ‘on’ or ‘off’. The backlit display also comes on/off at the same time as the lights, with three levels of brightness, accessible via the settings menu on the unit. Whizzing around Cambridge one rush-hour evening (where traffic on many of the roads now averages less than 15mph) is where I found the Emu to be the most comfortable and enjoyable. I like the design of the Emu bike. As I said earlier, personally I prefer the step-thru version as it gives it a slimmer, more efficient look. I think the bold colours work well and the design-conscious styling carries across to the accessories you can also buy to complete the look (branded panniers for example). You do get hub gears and a battery integrated into the frame and which is unusual at this price point. Out on the road, the motor can be noisy when accelerating but capable in the conditions it is being marketed for. 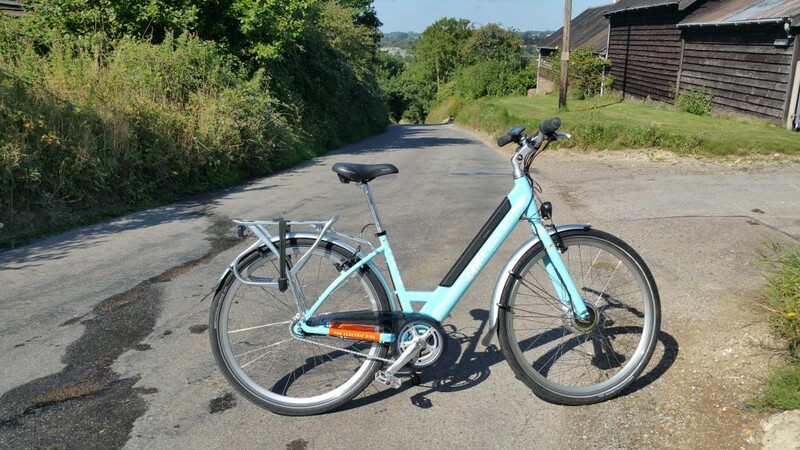 It did lose marks in the steep hill test, so if you are in a very hilly area this probably isn’t the bike for you unless you are able, and prepared to, put in a lot of effort yourself. It has a comfortable riding position and provides a decent range (with 40+ miles achievable on a single charge). 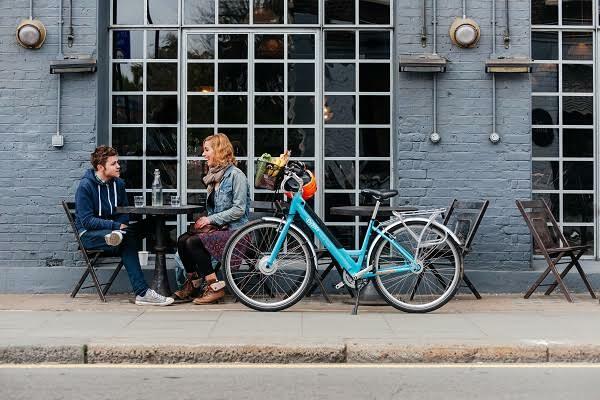 To appeal to a broad audience, and also because of the Cycle to Work Scheme tax break, there is a wide choice of bikes available around £1,000, but if you’re looking for an urban bike for your office commute, or just errands, popping to the shops etc., the Emu is worth adding to your shortlist. A 3-day test-ride is available where the bike is sent and collected from your home address, on application to Emu. Available from Emu directly via their website. There is no dealer network, but Emu told me there are a number of demonstrators dotted around so it is worth contacting them to find the nearest one. Also available is a 3-day trial/test period. Our thanks to Andreas at Emu for sending the bike to review. You can view more photos here in our Emu media gallery. What's the most efficient speed?